Many of our designers offer jewelry, bags and gifts that are priced $25 and under...just a sampling below to help you get ideas if you are needing something small, or LOTS of something small! 1-3/8 inches long including sterling earwire, 3/8 inch across. The mossy green leaves of Oregano are sealed on top of luminous white shell. 1-1/8 inches long including sterling earwire, 9/16 inch across. The delicate green leaves of Thyme are sealed on top of luminous white shell. 15 ounce clear wine glass stands 9 inches tall. For the princess, she wears pink, has crystal-studded tiara, carries a pink cell phone and pony spotted handbag, wears a big diamond ring, dances with a feather boa, or has her puppy along for shopping! 1-3/4 inches long including sterling earwire. Graceful 1/2 inch wide background metal is colored in bright orchid purple, shows off the silver stalk with leaves cutout dangling on top. From the manual typewriters you learned on (or perhaps your grandmother did), black faces with gold characters ringed in silver. These are used so not in pristine shape...you enjoy the history. Each is mounted onto a silvertone metal disk, 1/2 inch across, 1-1/4 inches long on surgical earwire. Keys as shown, sorry we cannot customize. Metal pieces with hash-marked texture finished in antique brass and pewter/silver colors make a sriking set. Pendant is 2-1/2 inches, freely suspended from 28-30 inch adjustable brass chain with lobster clasp. 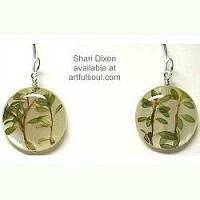 Earrings are 1-3/4 inches across and dangle 2-1/4 inches long from brass french earwires. The disk within open ring will move freely, the earrings are not lightweight, though not heavy considering their bold size! Sold as matched set. Metal pieces with hash-marked texture finished in antique pewter/silver color finish make a sriking set. Pendant is 2-1/2 inches, freely suspended from 28-30 inch adjustable silvertone chain with lobster clasp. 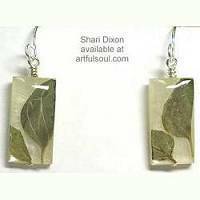 Earrings are 1-3/4 inches across and dangle 2-1/4 inches long from silverplated french earwires. The disk within open ring will move freely, the earrings are not lightweight, though not heavy considering their bold size!sold as matched set. 2 inches long including goldplated earwire, 1/2 inch across. Darkened brass chain drops delicately to hold circle of brass with antiqued bronze metal leaf caps holding aqua blue crystal. Simple laser cut stainless steel shapes, ultra lightweight, in a style that is flattering on almost every gal. Patterns under clear acrylic domes are accented by tiny color crystals. Colors featured are navy blue, aqua, ivory and coral red. 2-7/8 inches long, 1-1/4 inch across. Goldtone earwire with inverted teardrop that is wrapped in black cord, has beads extending outward along the bottom edge. Goldtone beads and jet black crystals, this can be dressy or casual, lots to show without being weighty. 1-7/8 inches long on sterling earwire, 3/8 inch across. Sterling chains hold charms of WHITE PEARL, navy blue crystal, and tag with squared letters X O stamped on one side. Large and fascinating pendant made of 2mm thick round aluminum, curved into flowing loops. Measures 3-1/2 x 1-1/2 inches, ultra lightweight. Comes on 16-1/2 inch black rubber cord with lobster clasp, but you can suspend from your own chain or strand of beads. Large and fascinating pendant made of 2mm thick round aluminum, curved into squiggly free-form shape. Measures 2-1/2 x 2-1/2 inches, ultra lightweight. Comes on 16-1/2 inch black rubber cord with lobster clasp, but you can suspend from your own chain or strand of beads. 8-1/2 inch wavy petal plate, ideal for salad or dessert, has satin white background. 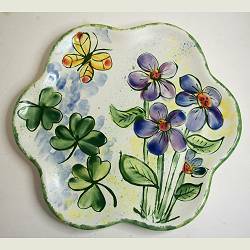 Hand brushed shamrocks, flowers and butterfly grace the foreground with a watercolor background, in colors of green, purple and yellow-reds. Green sponged edge to frame the design. Signed "Marcea" on the back, painted by Marcea Reid of Henderson, Nevada. The plate is an earthenware lowfire clay that is food safe and water tight from the glazing and fired at almost 1900 degrees. 8 x 10 inch "canvas" of clay, 1 inch deep is hollow on back for super simple wall hanging. Glazed with a quail motif, trees and flowers, using color-burst crystals as well as sheers with black outlines. Colors are earthy greens, tans, black and yellow-orange. Sides are glazed a dark brown woody motif. 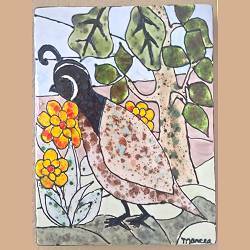 Signed "Marcea" in lower right corner (Marcea Reid of Henderson, Nevada), the canvas is a purchased earthenware lowfire clay that is fired at almost 1900 degrees. 4 x 2 inch pin is a trio of French ribbon flowers with 3 background leaves. Flowers are pumpkin shifting to green edges, cranberry and green/burgundy, leaves are dark olive, small champagne and smoky topaz crystal accents. Pin is backed with leather, a barpin clasp set lengthwise. 1-5/8 inches long including sterling earwire, 5/16 inch across. The dressy look of clear AB Swarovski crystals in a simple drop of diamond shape with bicones, they reflect into blues and golds. All the cool inner workings of a watch, without a face and cover so you can enjoy. This is not a functioning watch. Surgical steel post in back. 7/16 x 9/16 inch. Sunshine in glass, the citrus gold color varies in intensity as the folds of glass work the upper edges. Measures about 4 inches tall, 3-1/2 inches across, suitable for small tea light candle. 2-3/4 inches long on earwire, 3/8 inch across, an aluminum wire is hammered into a slight curve and loop at the top, black leather strip attached that curves naturally also. The aluminum has antiqued bronze color finish. A simple industrial look that is very lightweight. 2-3/4 inches long on earwire, 3/8 inch across, an aluminum wire is hammered into a slight curve and loop at the top, black leather strip attached that curves naturally also. The aluminum has satin silver color finish. A simple industrial look that is very lightweight. See Policies & Service Page about our Return Policy. If you are giving this gift in 2-4 weeks, which is beyond our 10 day policy, you may request UPON ORDERING for an extension of return time FOR EXCHANGE CREDIT ONLY. We are happy to do this, but please be sure to make this request when placing your order...the extension must be written onto your sales slip when shipped! We can also ship directly to the recipient with a gift card, the Shopping Cart provides places for all your details.